Equal opportunity is not the same as equal access to mediocrity. Vive la difference! 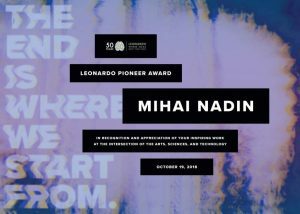 Mihai Nadin was the recipient of the Leonardo Pioneer Award in recognition and appreciation for his inspiring work at the intersection of arts, sciences, and technology on October 18, 2018. Mihai Nadin was invited to deliver the keynote address at the Second International Conference on Anticipation, to be held November 8-10, 2017 in London. Anticipation and Medicine, the third in a series of three international conferences took place at the Hanse Wissenschaftskolleg/Institute for Advanced Study (Delmenhorst, Germany) on September 28-30, 2015. Among the topics presented—and met with enthusiastic discussion: Anticipation and the Brain, Unorthodox Forms of Anticipation, Anticipating Diabetes, Wearable Health Devices, Adaptive Games, Intelligent Support for Surgeons, Breast Cancer, Anticipation and Autism, Safety and Quality in Healthcare, Personalized Proactive Medicine. The volume containing 23 texts, will be released by Springer in early 2017. Anticipation Across Disciplines, released in Fall 2016, is the second book in a series of three volumes, published in the Springer series Cognitive Systems Monographs. Papers presented at the international conference (September 22-24, 2014) of the same name cover topics such as information processing, politics, botany, architecture, botany, anticipatory computation, computer science, education, art/creativity. Readers seeking a foundation for anticipation will find in this book recent outcomes pertinent to plant life, political anticipation, cognitive science, architecture, computation. Leading scholars in economics, energy research, oceanography, engineering, and behavioral sciences working in the defining spirit of interdisciplinarity implied by anticipation provide rich evidence of anticipatory processes at work of a very large scope: from an art event (documented in this book) to experiments in neuroscience, anticipation in engineering, anticipatory expression in plants, anticipation in politics, and anticipatory computing.